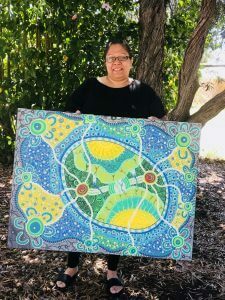 Recently HelpingMinds engaged with local Aboriginal artist and proud Badimia, Yamaji, Noongar women, Nerolie Bynder Blurton, to create a piece of work for our organisation. Nerolie far exceeded our expectations with this beautiful piece which will play an important part in HelpingMinds branding. The piece is titled Good Healing Place and below is Nerolie’s explanation around all of the elements in the story. The large oval shape represents “HelpingMinds”. 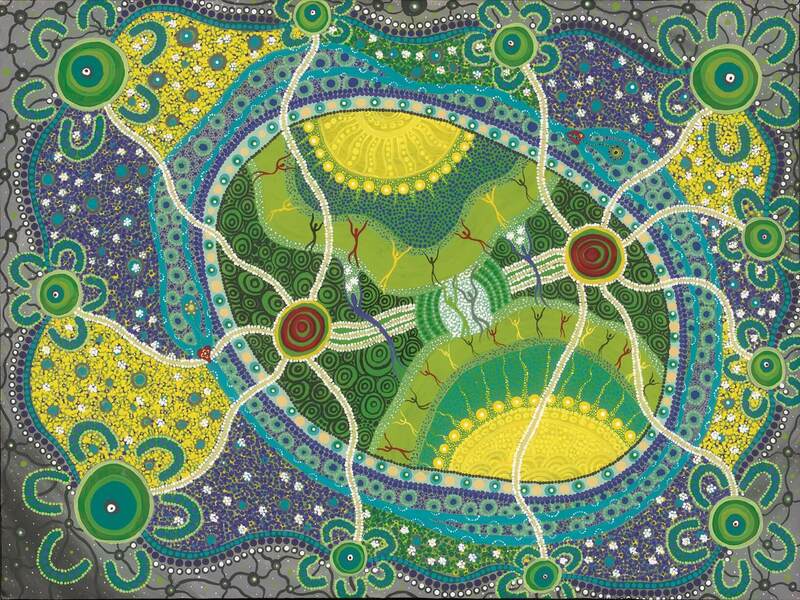 It is shaped as a womb as it is about giving life back to people, in a safe trusting place. It is the centre of this and the beginning of the healing, with the people from HelpingMinds (the green and grey small spirits, who are good spirits), reaching the adults ( the red black, and yellow spirits above them). The smaller spirits are children coming from the ground, growing reaching through to them as well by connecting. The sun rising in the morning and the sun going down and setting in the evening are the signs of great hope always for the people. The families are now connected to the place of healing minds. They now have trust, respect and support for their healing. The blue spirits beside the safe place are the people telling their stories about the healing place to the families, friends and many people. They are on the travel lines leading to the burning fires, letting others know of their story. The fires keep burning and provide a warm place to share. The fires are the home and hearts of many others who come together. The special stories of each person travels out from here through to many on country. The concentric circles are water and represent life itself. The water has a ripple effect, starting small and moves outward, letting more and more people know about the good healing place to help your minds. The large joined blue spirits are our inner spirits, that are circling the safe healing place are now getting strong but are at different stages of healing. One with the full strong heart and bright full sun in its mind, is now much happier and healed a lot. It is now connecting with the other spirit whose heart is a bit broken and the sun has shadows in its mind but by yarning and helping the other inner spirit is now beginning to heal as well. The large spaces of blue, yellow and green is the land, the country, the community, the people of places big and small who we need to travel to, so they too, can be helped in this same way. The journey that begins from the good helping place is connecting to all the outer groups and families, who are now talking together with the helping place. The yarning circles with the people sitting around the helping place surrounding it with more and more people working together, people from all walks of life, connecting as one. (the green circles surrounding with the “u” shapes represent people sitting around those places together). The small grey circles with connecting lines are yet to be travelled or reached to get the support they need but with the word spreading and connections being made. The lines lead off and are always continued, going out further and further it is slowly happening. The painting is deliberately out of balance and not so perfect, which is perfectly alright, just as in life, there is always hope in HelpingMinds.